Apply for corporate and branch positions online using the Wells Fargo job application. Although retail positions may have been able to be applied for in-person in the past, candidates are currently required to apply online by visiting the careers site. Retail positions include teller, manager, assistant manager, consultant, and more. About the Company: Wells Fargo is one of the world’s largest banks, and has more than 6,000 branch locations/offices in the United States. Step 1 – The first step is to go to the main careers page (click here – link will open in a separate browser window/tab). Step 2 – Click the “Search Jobs” link (outlined below) to go to the main search page. 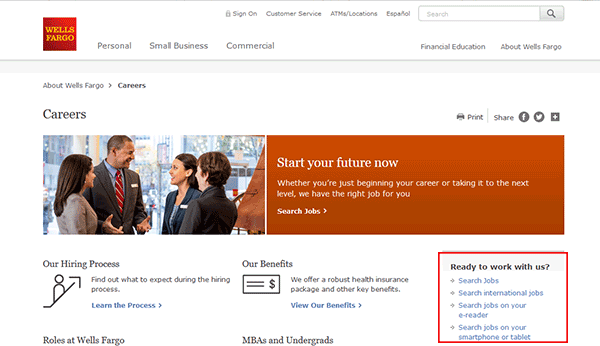 Step 3 – Hit the “Search Jobs Now” button. Step 4 – Filter the results by location (state, region, city), job family (category), or job status (full/part-time). Step 5 – After filtering the results and finding a job you’re interested in, click the title of the job to move to the next step. Step 6 – Read the job overview and then scroll down the page. Hit the “Apply” button to start. Step 7 – Sign in to your account (or create a new one – click the “Register Now” link). Step 9 – Answer the pre-qualification questions. Step 10 – Resume – Upload your resume, if you do not have a resume select the “Submit without a resume” option. Step 12 – Complete the application process by providing the required information for the “Questionnaire” and “Self-Identification” subsections.